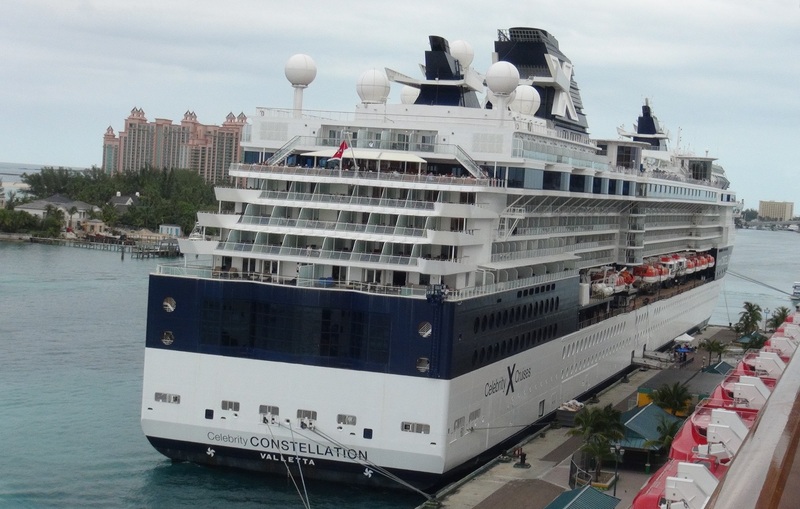 During winters, Celebrity Constellation offers 3-, 4-, and 5-day Bahamas cruises from Ft. Lauderdale featuring stops in Key West, Florida and Nassau, Bahamas, and Western Caribbean itineraries featuring stops in Key West and Cozumel, Mexico. In the summer, the Constellation sails various itineraries Europe, covering the Mediterranean, Europe, Baltic and Russia. See www.celebrity.com for specific schedules. Activities for kids ages 3-17. Located on Sunrise deck 11. Younger cruisers ages 12-17 can cut loose and kick back the way they want in a hip VIP area geared specifically for teens. Includes teen-oriented explorations to the dance club and coffee lounge designed with them in mind. Seaside pool/Café/Grill, AquaSpa, Persian Garden Turkish Saunas, Fitness area. Basketball, compact football, paddle tennis, volleyball, golf simulator and more. Located on Sports Deck 12. Celebrity Constellation features some of the most popular venues found on the line's Solstice Class ships, including the Tuscan Grille steakhouse, Bistro on Five, ice-topped Martini Bar, the Café al Bacio and Gelateri,; Cellarmasters wine bar, complete with the state-of-the-art wine serving systems known as "Enomatics," allowing guests to select and serve wines by the glass at the touch of a button, and new color schemes, carpeting, and upholstery reflective of the Solstice Class' stylish, modern design in every public venue. In 2010, more suites were added and staterooms were restyled with entirely new carpeting, flat-screen TVs, upholstery and bedding. Every stateroom offers a thermostat controlled A/C, telephone with voice mail, shower, hair-dryer, interactive flat-screen television, VCR, mini-bar and safe. Guests receive twice daily room service, a robe, and water & wine glasses. Ocean View 170 Sq. ft.
Spa-inspired staterooms featuring indulgent amenities like a Hansgrohe® shower tower and custom blended bath products to help you feel restored and renewed. Guests receive complimentary access to the relaxing Persian Garden and priority access to Blu restaurant serving breakfast and dinner. Other special aqua-class perks include daily delivery of bottled water and tea, priority check-in and disembarkation, additional shower amenities , on-demand wellness programming, and an upgraded room service menu. Suite accommodations include butler service, personal computer, printer and internet service, personalized stationary, terry cloth robes in your stateroom during the cruise, priority check-in and debarkation, express luggage delivery, dining room seating preference and in-suite dining. Experience full service in-suite dining for all meals, complimentary daily in-suite espresso and cappuccino, afternoon tea. Suite guests indulge in extra amenities like oversized cotton towels, additional custom bath products, a massaging showerhead, and slippers. You can see the menus at the Celebrity Dining section of the Celebrity Cruises website – click on specialty dining and scroll down, you will see a list of restaurants on the Celebrity Constellation. Experience award-winning cuisine, superlative service, and stunning ocean views in a most refined dining atmosphere. The airy and contemporary main restaurant, offers up to 29 exquisite selections, with most changing every night to give you a rich variety of classic and contemporary choices. Grand buffet offering favorites like homemade waffles at breakfast, pizza, salads, sandwiches, meat dishes and more. Offering healthy and flavorful dishes next to the Aqua Spa. Clean, crisp flavors and inventive cuisine. Tender steak is served with a flavorful truffle vinaigrette instead of a heavy béarnaise. Exclusively for Aqua-Class Guests. If only your local coffee shop had ocean views like these. Savor a cup of freshly brewed coffee or a delightful liqueur in this lively European style coffee house. A la carte. Treat yourself to the gelateria, where sumptuous, and gorgeous, Italian ices and gelatos are prepared afternoon and evening. A la carte. This lively, contemporary steakhouse serves a succulent selection of pastas, seafood, steaks and salads. The atmosphere is graced with a hint Italy, making it both rustic and sophisticated. $35 per person. The Bistro on Five features a variety of sandwiches, salads, crepes and desserts for both lunch and dinner. $5 per person. Oceanliners offers two menus options including a regular four course menu with typical gourmet selections, and the "Five Senses" menu, pairing different wines with a six course food selection. $45 per person. Enjoy breakfast on your veranda or a romantic dinner for two from the resplendent privacy of your stateroom. Complimentary. Main show room offering Broadway and Circus shows, Song and Dance spectaculars. Keep in touch 24 hours a day in the Celebrity iLoungeSM, our one-of-a-kind hip Internet lounge that is the first Apple® Specialist at Sea. Celebrity iLoungeSM also offers various iLearn classes to help you master the latest photography, video and audio skills. Cabaret style club featuring comedians, singers, magicians, jugglers and more. Includes a dance stage. Observation area by day and disco by night. Located on Sunrise deck. Experience a global wine tour and discover new wines, receive recommendations and enrich your knowledge of wines. Using the state-of-the-art Enomatic® wine-by-the-glass dispensing system, swipe your SeaPass card and it will pour your choice directly from the bottle in a 1-ounce, 2.5-ounce or 5-ounce portion. Two-story library located on Panorama and Sky decks. Play craps, poker, blackjack, slots and more. The sophisticated Martini Bar offers 20 variations of this famous libation. Located at the Platinum Club on Entertainment Deck 5. Located on Sunrise Deck 11 aft. Let the serenity surround you at this indoor pool reserved for adults only. The sound of waterfalls will transport you to a divine state of relaxation while you stretch out on thickly padded lounge chairs or melt away stress in the hot tub.